1st Royal Dragoons capturing the eagle of the 105th Regt at Waterloo. Dragoons were originally intended to be used as mounted infantry. In the early 18th century, cavalry was divided into 2 categories - regts of horse and regts of dragoons. The regts of horse were used in the traditional role of heavy cavalry - ie shock action. Dragoons were used mainly for reconnaisance - and usually fought dismounted in battle. However, by the time of the Napoleonic wars, this distinction of horse and dragoons had no more practical significance. Dragoons detested their dismounted role and over time, developed into heavy cavalry. The changed role of the dragoon arm required that regts of light dragoons be raised in order to perform the reconnaisance role. Notwithstanding the changed role of the dragoons, they still retained the capacity to fight dismounted - notably at Buenos Aires (1807). British dragoons served with distinction in the Peninsular War and during the Waterloo Campaign. However, as was the case with the British cavalry in general, they tended to get carried away in the heat of the charge leading to disastrous consequences. 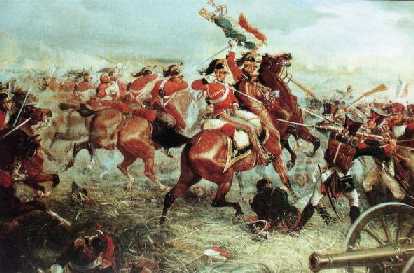 The most famous instance of this is the legendary charge of the Scots Greys (2nd Royal North British Dragoons) at Waterloo: after smashing through the French infantry of D'Erlon's corps and in capturing the eagle of the 45th Regt in the process - the Scots Greys, charging out of control, were badly mauled by fresh French cavalry. Any account of British dragoons would be incomplete without mention of the 2 excellent dragoon regts of the King's German Legion. Their most famous charge was at Garcia Hernandez - during the Peninsular War - when they charged and broke 2 French infantry squares. These 2 dragoon regts were converted into light dragoons in 1813. 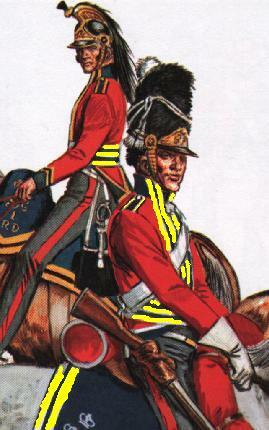 The dragoon uniform was updated in 1812. The jackets were as shown - but they wore the wool crested helmets similar to those worn by the Household cavalry in 1815. In 1813, the dragoon helmets were changed to the horsehair helmet shown below. The 2nd Royal North British Dragoons (Scots Greys) were allowed the distinction of wearing a bearskin grenadier hat to commemorate their victory over French grenadiers of the Maison du Roi whose colours they captured at Ramillies in 1706. Above illustration reproduced with kind permission of the authors - Liliane and Fred Funcken, Historische Uniformen.